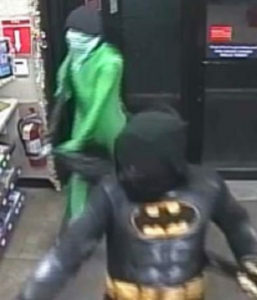 These two men in costume robbed a convenience store in Council Bluffs. Police in Council Bluffs say two men robbed a convenience store in western Iowa early this morning dressed in super hero costumes. One of the suspects wore a Batman costume, the other a green, full-body suit. They stepped inside a Casey’s General store on south 24th Street a little before 4 a.m., apparently wielding a sword and a rifle. The robbers gave the clerk a bag, who filled it with an undisclosed amount of cash. The two men then left the store through the back door. If you have any information that may help solve the crime, call the Council Bluffs Crime Stoppers at 712-328-7867.